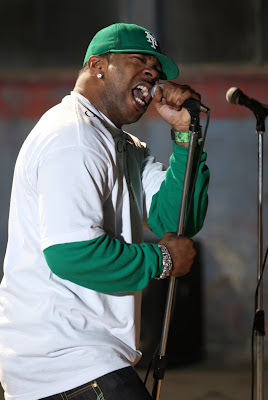 Busta is back! 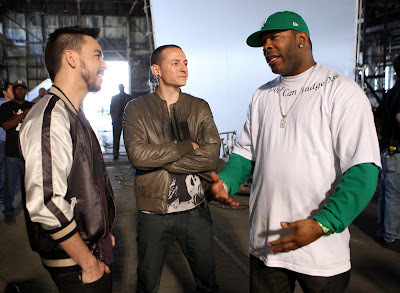 Photos from the shooting of We Made It with Linkin Park from a couple days ago. This'll be the first single off the forthcoming album, Blessed. Press release detailing the video shoot below. 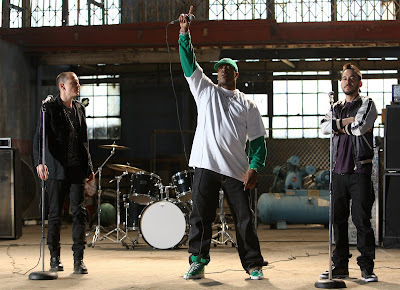 SANTA MONICA, CA – April 15, 2008 – Not only is multi-platinum two-time Grammy-winning rock band Linkin Park featured on the first single from acclaimed hip-hop innovator Busta Rhymes' new album, but the band 's co-lead vocalists Chester Bennington and Mike Shinoda will also appear in the song's performance video. "We Made It," directed by Chris Robinson, will be shot in Los Angeles on Tuesday, April 15. 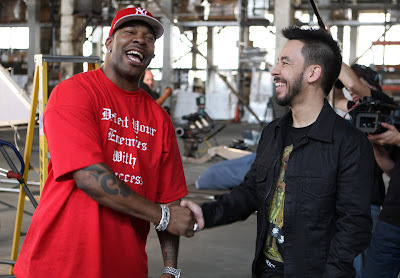 “We Made It,” produced by Cool and Dre, with additional production by Mike Shinoda, and its video will be released in May, prior to the debut of Rhymes’ eighth studio album, Blessed (Flipmode/Aftermath/Interscope), on June 17. Linkin Park (vocalist Chester Bennington, drummer Rob Bourdon, guitarist Brad Delson, DJ Joe Hahn, bassist Dave “Phoenix” Farrell and vocalist Mike Shinoda) has been touring in support of its double platinum album Minutes To Midnight and new hit single “Given Up.” The album, one of the highest-debuting discs of 2007 and the seventh best-selling album of the year, has already spawned three Top 10 hits (“Bleed It Out,” “What I’ve Done,” “Shadow Of The Day”), amplifying an already illustrious career. Since arriving in 2000, Linkin Park has won two Grammy Awards (Best Hard Rock Performance with their hit single “Crawling” and Best Rap/Sung Collaboration with Jay-Z for the aforementioned “Numb/Encore”), sold more than 45 million albums worldwide (its diamond-certified debut Hybrid Theory has sold more than 18 million copies), and garnered an international fanbase. The band recently announced the highly anticipated lineup for Projekt Revolution 2008.